Who killed the hybrid car? As far as I know, GM never dispatched (then withdrew and crushed) a test fleet like they did with the wildly popular EV1 in California. 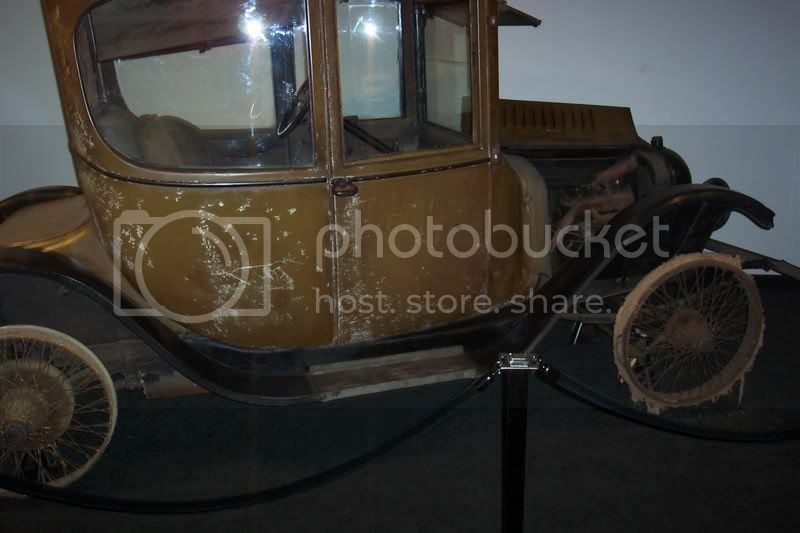 This entry was posted on Tuesday, January 9th, 2007 at 12:44 pm	and is filed under Automotive. You can follow any responses to this entry through the RSS 2.0 feed. Both comments and pings are currently closed. 10 years later, a guy named David Arthurs allegedly built a home made hybrid as published in Mother Earth News at Hybrid Car. I actually remember the article (I have all of the old Mom mags in boxes). In 1993, he updated it with a 4-wheel drive pickup, by dropping the rear driveline and hooking the electric motor directly to the rear differential. I have always had my doubts about how well he claims that this worked, but I have a little Toyota MR2 with a blown motor that I would love to convert if I had the cash. Very cool, an Opel GT hybrid with a lawnmower engine! I love it. What about the 3.5 V-8 in your 280SE? Now That was an internal combustion engine to behold! Geoffrey – What I meant was that the response among the test group was overwhelmingly positive. Our language is strange isn’t it? Even a single entity can be wildly popular. It certainly was, and thanks for reminding me of that auto from my past. You what I find interesting is the thing I always recall first when I think of my 280, was the smell of the interior. Despite owning it decades after it was built, it still retained a unique, and satisfying smell. Similar to my old VW bug. But nothing like say an old Toyota or Ford. German engineering BO? Wasn’t it a FORD Pinto, but a CHEVY Vega?!??!!?! What kind of crap is this? I seem to recall my folks had one, my brother the other…..
Dave, yes. The Ford Pinto being famous for catching fire in rear-end collisions. The Chevy Vega famous for absolutely nothing but being ugly, but not even very ugly (like, say, the Gremlin or the Pacer, both from AMC). Having a Vega as my first car I can assure you they were famous for warping engine blocks due to their fine Detroit engineering. Will, the smell you’re referring to comes from the bizarre stuffing the Germans used to pad the seats with, back then. It looks like tightly bunched, dried spaghetti or Ramen noodles. Even my old ’77 320i had that smell, because it had the same stuff. I will say: you’re the only person I ever heard refer to that smell as “satisfying”. To me, it was just the opposite. In 1917 a Company from Los Angeles made a Hybrid car, it looked like something from a Tim Burton movie. I have a friend with an 87 Audi, Love the way that car smells. Woods is the company, it’s actually made of metal. Me too. I use to love the sound of a v8 motor, built, with big cam and flowmaster exhaust system. after watching “who killed the electric car?” and I learned that gasoline powered cars waste 80% of their energy creating useless heat and smog. now all that engine and exhaust noise turns me off. only puts 20% of its energy to move the car, all that noise, what a waste. I bought a Prius Hybrid, Love it. Fifty Miles Per Gallon everyday. this is my new turn on. In the ad in tinktony posted the car in the picture looks like an Opel Cadet. I think that Opel also had a hybred prototype out at the same time that used a large flywheel. Has anyone ever tried this new car http://www.topgreencars.com/ I was thinking of getting one. Uh, which new car Mike? I think I saw several. My thinking is that plug-in hybrids should be capable of plugging in while on the move, not just when parked. The technology for plugging in while on the move already exists and has been around for over a 100 years. Most of the worlds fixed route electric transport (from trolleybuses and electric trams, to the world fastest trains) does it. This would now mean that the batteries could be used less often, and if the vehicle never ventures far from the power lines, their size and weight could be minimised relative to the payload. This may also make the batteries more efficient, and if using them less often prolongs their life, this would reduced that rate at which the batteries need to be manufactured and disposed, hardly a pollution free task. But notwithstanding environmental remanufacturing costs, consider that fact that for an electric car to travel and considerable distance per day entirely on battery power, the batteries would need to be replaced many times over the vehicles lifetime, to do this on such a large scale maybe highly uneconomical. On the other hand, providing, for example, overhead wires (like those conveying power to trolleybuses) are added on major highways, then in many cases, the onbroad generator would hardly be needed at all, even if smaller batteries are used. Myrtone, I wish more people would be thinking like you. I move from Canada 30 years ago to built flywheel/ice car,flywheel/electric and electric/ice hybrid vehicle for a small company in NC. We succeed regular improvement of around 50 pour cent in fuel economy and never succeed to obtain government grant; however, we had our work published in major symposium and engineer publication. Many patents exist for electric car feeding during travelling including automatic driving guide rail, several Co.are trying to bring this technology to the market right now. Best hope… Joseph. I am project engineer and responsabile for make news products in Brazil, since 1983. This Hybrid car is a beatiful idea.